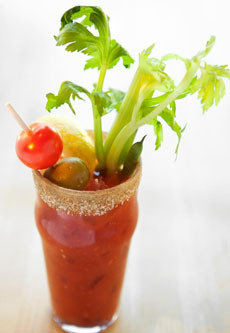 New Year’s Day is also National Bloody Mary Day. So today’s tip is: Find a new garnish for your Bloody Marys, and change it up every year. A celery stalk garnish and optional lemon or lime wheel was de rigeur 20th century. Savvy hosts replaced them with a fennel stalk for the new millennium (there’s a word you haven’t heard in a while!). But that was 14 years ago! So here are 10 groups to consider for your “signature garnish.” You can mix and match them as you wish. And yes, you can even match them with a celery stalk and any form of lemon or lime. Creative types can get out the vegetable cutters and transform cucumbers, carrots, jalapeños, etc. into edible sculptures. 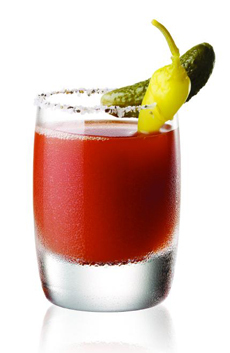 A modern and easy Bloody Mary garnish: a gherkin and pepperoncini on a pick with a salt and pepper rim. Photo courtesy AGWA.